Everyone likes Sev at my home.This is crunchy and awesome tea time snack. It is versatile and is used in several dishes. It is used as a topping or to garnish almost all chaat foods. It can be had plain or spiced with some chilli powder and garlic. 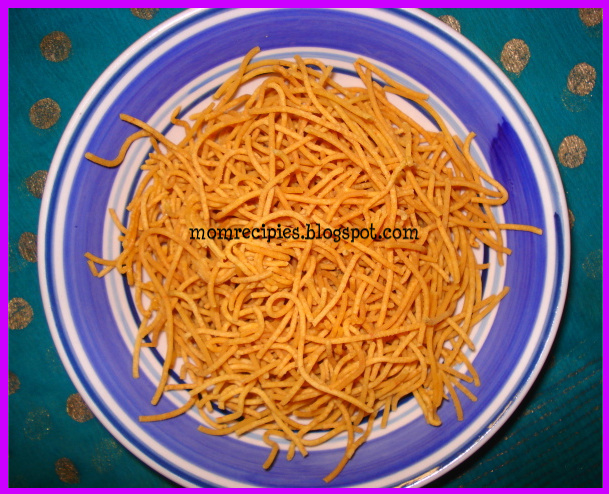 This is the traditional dish prepared at home during festivals like Diwali. 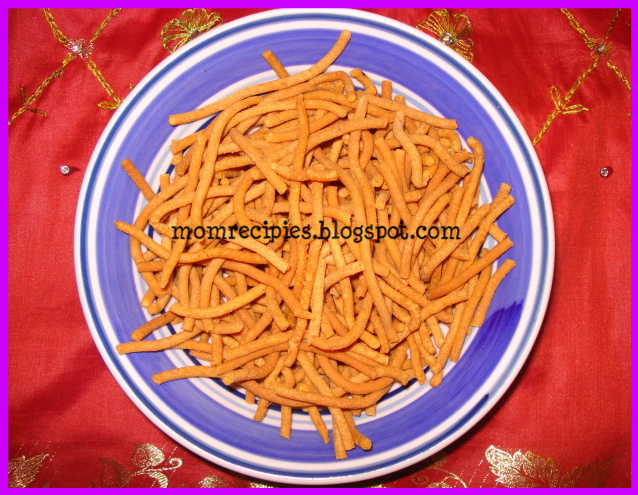 Here is the recipe for crunchy and delicious Sev as prepared by my mother. 1) Mix all together rice flour, gram flour, salt, hot ghee or oil, chilli powder ,Cumin seeds powder,Carom seeds powder,turmeric and combine well. 2) Slowly add water little by little to make a soft dough, just soft enough that it is pressed through easily with the chakali press. 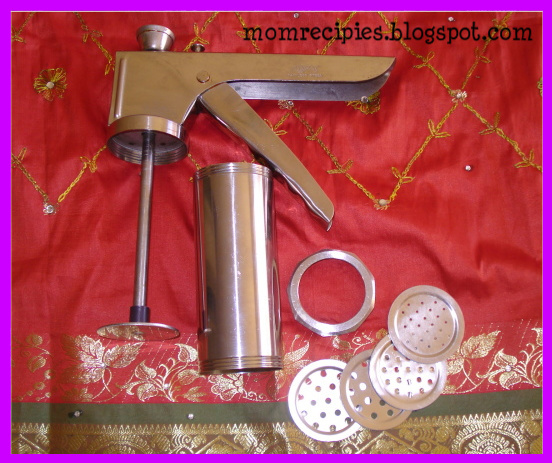 3) From chakali press replace the chakali attachment with sev attachment . 4) Adjust the dough for salt before deep-frying. 5) Heat a wide heavy bottomed pan with enough oil for deep frying. 6) Take the sev press and fill with the dough .Once the oil is hot, reduce to medium flame and press the sev press in circular motion to make concentric layers of the sev dough. As you press the dough into the hot oil, you will find the oil froths up in bubbles which will eventually subside as the sev turns to a golden colour. Fry for a minute on medium heat to achieve that golden color and crispness.Don't over fry otherwise colour turns to brown. 7) When the sev turns a golden color, turn over to the other side and let it also cook to a golden colour. Use a slotted ladle to remove to an absorbent paper and cool. Crush gently with hands before storing. 8) Cool completely before storing in an air tight or metallic container. 1. 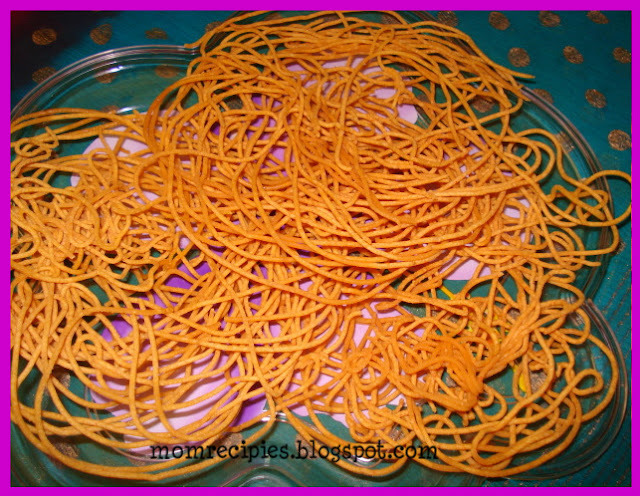 You can also flavour the batter with garlic paste or spinach purée to make garlic sev or spinach sev. Wish you and your family a very happy Deepavali !